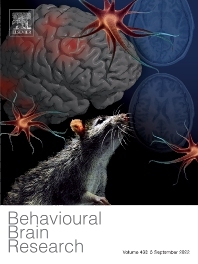 Behavioural Brain Research is an international, interdisciplinary journal dedicated to the publication of articles in the field of behavioural neuroscience, broadly defined. Contributions from the entire range of disciplines that comprise the neurosciences, behavioural sciences or cognitive sciences are appropriate, as long as the goal is to delineate the neural mechanisms underlying behaviour. Thus, studies may range from neurophysiological, neuroanatomical, neurochemical or neuropharmacological analysis of brain-behaviour relations, including the use of molecular genetic or behavioural genetic approaches, to studies that involve the use of brain imaging techniques, to neuroethological studies. Reports of original research, of major methodological advances, or of novel conceptual approaches are all encouraged. The journal will also consider critical reviews on selected topics.